Imagine the following scenario. Catastrophic floods have hit your country. More than 100,000 houses are toppled or submerged in mud. Over a million people are affected by the disaster. At the same time, one of your country's richest businessmen decides to take his wife to London. But this was just to deceive her. In fact, the real destination was Copenhagen. When she arrived, she found 80 friends had come too, and French musicians Nouvelle Vague and the British band Suede were performing. No, they weren't fleeing the floods. It was her 50th birthday, and her husband, Emil Tedeschi, had decided to surprise her. When he returned, his company helped by donating some goods. That is what "social responsibility" means today: first you earn a lot of money, then you give away a small percentage and you can continue to party without remorse. During the first wave of floods in Serbia, I witnessed a similar situation. If you were in the centre of Belgrade, you could easily believe it was just another heavy rain. In fact, it was A Tale of Two Cities. It was, as Dickens succinctly put it, "the best of times, it was the worst of times". Biljana Srbljanović, a famous Serbian playwright and usually a voice of reason in the depressing Serbian political reality, made a not particularly funny or smart comment on her popular Twitter account: "Excuse me for not being compassionate, but you have 10 more minutes to swim to the gallery for the promotion of my book." This set off a wave of condemnation in Serbia. Although Andrej Nikolaidis is right to claim in a Comment is free article that floods have united the people of the Balkans, it is not only rediscovered solidarity that has surprised many of us who survived the wars of the 1990s – when instead of helping to save a house, neighbours were burning down buildings just because someone was Serb or Croat, Muslim or Christian. After the current mood of self-congratulation, we should ask some serious questions. It is not only the spring of solidarity, it is also the winter of despair in the Balkans. And if we had everything before, soon we will have nothing. What lies under the surface of the catastrophic floods is not only a natural disaster, but also a social disaster. It is as if the Dutch king, Willem-Alexander, was right when last year he declared that "the welfare state of the 20th century is over". In a nationally televised annual address, the king said a new "participation society" would take its place, in which people must save and invest to create their own social safety net with less help from the government. 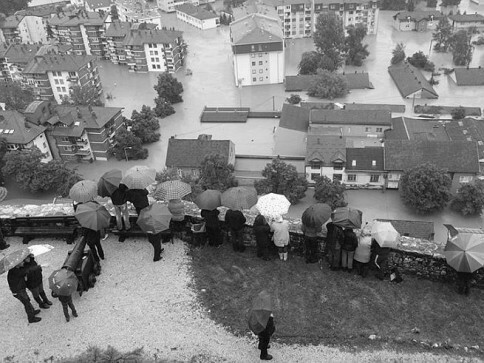 The severe floods in the Balkans showed that the king was right. What we got here was a "participation society". People from across the former Yugoslavia were organising their own social safety nets, sending clothes, food and medicine to those in need. And, yes, we, the people of the Balkans, should be proud of that. On the other hand, as the water subsides, on the surface it becomes more evident how the Croatian, Bosnian and Serbian states failed not only to warn people or rescue them, but also were complicit in the tragedy. In these times, there is no such thing as a "natural disaster". The "natural disaster" is always enabled by social factors. In the past two decades, these Balkan states reduced investment in the construction and maintenance of dams and embankments. During the time of Yugoslavia, only in Serbia did the government plan to build 34 more dams to regulate the waterways of the Danube and Sava rivers. To date, only five dams have been built. Now the water management companies across the Balkans are gradually being privatised. We should resist the temptation to sink into self-congratulation because of renewed solidarity from Yugoslav times. What should worry us, instead, is that Willem-Alexander's proclamation is coming true. When the next catastrophe comes, we will be left to pull ourselves out of the swamp by our own hair.